Marlon and Annetje moved from Los Angeles to Holland in '93, with the goal to make Salsa as popular in Holland as is is in the US. In LA they taught Salsa, made choreographies for video's and television productions and danced, among others, in the 'Mambo Kings'. In Haarlem they started 'Club Asi! 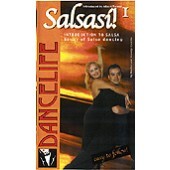 ', now one of the biggest Salsa centers in the Netherlands. This dynamic Ecuadorian/Dutch duo organizes, in cooporation with Albert Torres prod., the annual European Salsa Dance Festival, where the top of Salsa Dancing meets.